In the 17th century, decorative purses such as this one were rarely used to carry money. Their wealthy owners engaged in few commercial exchanges requiring cash. Some were used as 'sweet bags', holding perfumed powder or dried flowers to cover body odours in an age before daily bathing. 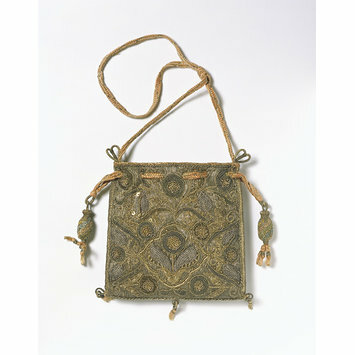 Other purses served as a form of 'gift wrapping' for small presents or gifts of money. 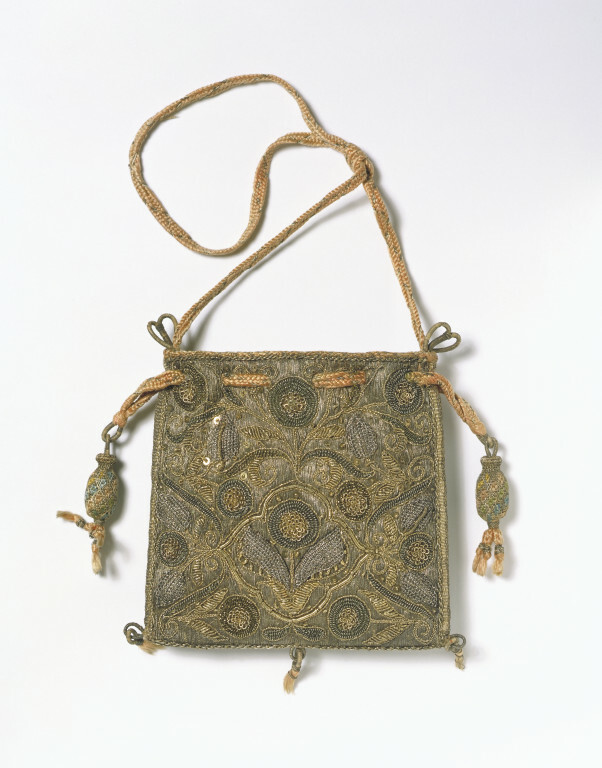 Purses could contain mirrors for grooming or function as sewing kits which held needles, thread and tiny scissors. The technique of this purse is unusual. Normally linen was used as a ground for embroidery, but in this case it is heavy paper. The thick application of the metal thread and extensive use of metal purl gives the purse a very rich three-dimensional texture. The pattern features two favourite Jacobean motifs, roses and pea pods. Most embroidery designs of this period are inspired by flowers and plants that grew in the garden. Purses like these had many uses. They held personal items, such as a mirror. They also held dried herbs or perfumed powders to hide unpleasant smells.